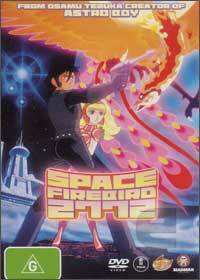 Space Firebird 2772 is the 1980 anime classic that puts a twist on the familiar with amazing consequences. In the distant future, Earth is no longer a home world for mankind and humans are now produced in scientific laboratories who are then raised by robots, rather than humans. Anyone thinking Matrix? The story revolves around Godo, a soon to become hero for mankind who is also destined to become a pilot but when the powers that be discover that Godo is in a relationship with one of the Elder's daughters, Godo is sent to a prison facility. Vowing to resume his relationship and seek freedom, Godo escapes the prison colony and seeks the legendary firebird that has the power to restore life to his dead home world... the planet Earth. With great animation, an amazing storyline and great 80's style special effects, Space Firebird 2772 is truly a masterpiece in the world of anime. Space Firebird 2772 was also created by Osamu Tezuka, the creator of Astroboy, so viewers automatically know that they are in for a treat with its enthralling storyline and non-computer generated animation that really makes this title one of the better anime titles out. Highly Recommended! The quality of Space Firebird 2772 is one of those amazing anime DVD's from the 1980's that doesn't really seem to date as it's presented in 16:9 widescreen with Dolby Digital 2.0 stereo.